The elephant Susi at Barcelona Zoo in Spain. Admittedly, Susi looks sad. Her skin droops, and her dark eyes seem a little teary. She's said to occasionally rock back and forth with apparent anxiety. And then there are reports of her eating her own feces. But does that add up to mental illness? Determining depression, let alone among nonverbal members of the animal kingdom, is always tricky business. But such is Susi's plight that the Queen of Spain and a famous writer have weighed in. And so now, the question about what to do with Barcelona Zoo's star elephant has taken on new urgency. Nevertheless, the charges sting. The zoo says it is undertaking temporary measures to improve Susi's living conditions, nearly doubling the space dedicated to elephants and replacing the concrete floors with dirt, which is kinder to elephants' sensitive feet. It has also been actively searching for a new companion for Susi since Alicia died. "That's not a solution," replies Garcia about the improvement plans. "[The current condition of the elephant quarters] just makes things worse for another elephant." The reason for such suspicions is that Barcelona  the most politically progressive of Spain's cities  is currently engaged in a massive renovation of its 117-year-old zoo. When the project is completed in 2015, the city will have a marine zoo on the shore, and a second, habitat-based zoo for land animals in the urban center. "We're transforming ourselves from the traditional, cage-based zoo to a modern conservation center that teaches respect for biodiversity," says Trepat. Susi's alleged unhappiness may become a weapon to attack the very idea of a zoo for Barcelona. So is Susi a pawn in a larger war? Or is she really depressed? "If she's really eating excrement, if she's displaying rocking behavior, that would be abnormal for an adult elephant in the wild," says Dr. Joyce Poole, director of the conservation group Elephant Voices. At the behest of Libera and FAADA, Poole plans to travel to Barcelona to examine Susi's behavior for herself. But based on her studies of elephants in Africa, she admits to a certain bias. 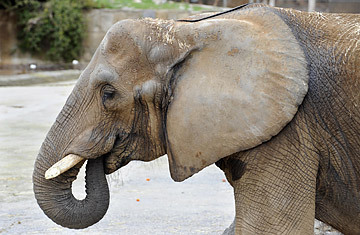 "Personally, I don't think we should have elephants in city zoos," Poole says. "Elephants in the wild are active in mind and body 24 hours a day  listening over long distances, smelling predators with their extraordinary sense of smell, interacting with friends and relatives. What urban zoo can provide that?"